On a normal weekday morning, breakfast for me tends to go in one of two directions: the healthy option, consisting of some sort of whole grain cereal (Grape Nuts if I can find them) topped with a handful of berries and dampened with a little milk or yogurt, or the less healthy option, featuring a toasted cinnamon raisin bagel and a thick smear of cream cheese. Whichever direction I take (and lately it’s been the less healthy one) these various provisions are purchased at the Korean-run deli around the corner from my office, where the ladies manning the cash registers couldn’t be nicer, and the quality of the food — bagel, berry, what have you — is never better than just okay. While I sometimes wish for something a little more inspired to start the day, in the end there’s my desk to get to, and with it some sort of deadline to meet, and any fantasy of searching out a better breakfast is quickly swallowed up by more pressing concerns. All of which makes those occasions when breakfast is something more that just a meal consumed in front of the computer screen an event worth elevating. Of course, such moments tend to fall on weekends or holidays, times when the first meal of the day happens somewhat later in the “morning,” and when it frequently does double duty as the second meal of the day as well. In other words, we’re talking Big Breakfasts here — the kind that in another time or place would fuel you through a morning spent baling hay or herding livestock but that for most of us these days is simply a good excuse to gather friends and family around the table to eat the sorts of foods we all love but rarely allow ourselves to indulge in. Not unlike Thanksgiving, though in a smaller, less gut-busting kind of way. 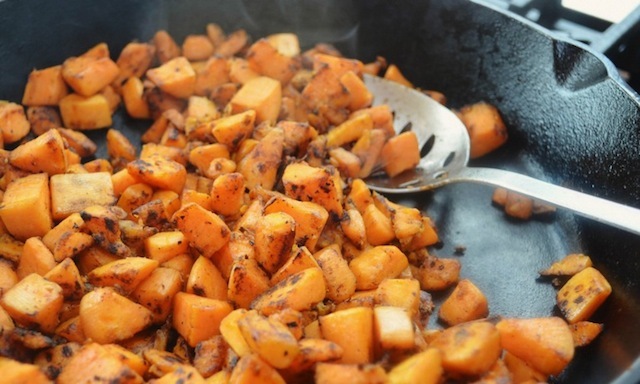 I suppose that’s one reason I was so drawn to this recipe for sweet potato and pork belly hash. Maybe it’s that the whole thing is cooked up in a skillet (I’ve already shared with you my weakness for this particular cooking implement), or that it makes ample use of one of fall’s signature vegetables, or that it employs the yin and yang of red wine vinegar and Maple syrup as a final flavoring component, but whichever the case, something about the dish struck the fantasy chord for me. In this, the recipe (from the September issue of Bon Appetit, an issue that keeps on giving — see posting from Sept. 8th) produced the reaction I invariably hope for whenever I’m scanning instructions for a new dish, namely the immediate conjuring of a variety of tantalizing scenarios in which I might prepare it. Experience that and you know you’ve landed on a keeper. That fantasy element is half the fun of reading cookbooks and cooking magazines (and one reason I like to do it just before turning out the lights each night). Of course, if your instincts are good, actually making and eating the dish can be just as pleasurable, as was the case here. Part of that for me was learning to prepare something I’ve never worked with before, namely pork belly. It’s an item that’s showing up on an increasing number of restaurant menus and for good reason — once cooked it’s wonderfully tender and flavorful. 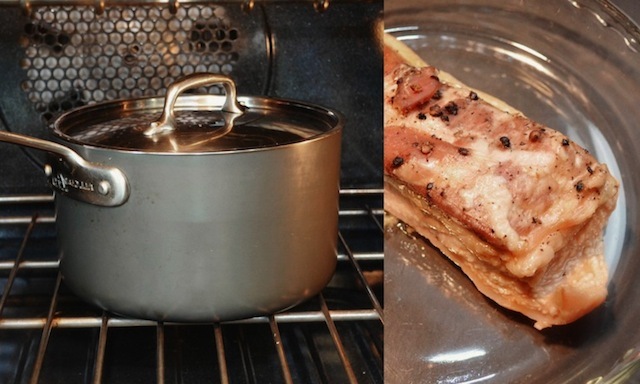 The catch is that getting it to this point requires a few steps, namely a slow braise in the oven, followed by an overnight stay in the fridge to further break it down, and finally the removal of the skin (steps illustrated in the images below). What’s more, it’s an item few butchers carry, so you’ll need to order it in advance, either through your local butcher, or via the online resource listed below. If all that sounds like too much to bite off, you can always substitute the pork belly for slab bacon as I did on one occasion. The latter is something many butchers do tend to stock, and there are no preparatory steps involved, so it’s certainly an easier option. What’s more, the two are closely related (bacon is simply pork belly that’s been cured), so the switch is a logical one. Of course, there will be differences: bacon has a smokier flavor and a chewier texture (similar to that of the salty meat one finds in a frisee aux lardons salad) than the pork belly, whereas the pork belly is juicy and tender-crisp in a way the bacon can’t approach. All things being equal, I’d probably opt for the pork belly — there’s just something about the slightly fattier quality of the uncured pork that lends the dish a certain decadence, but either way, you can’t go wrong. And the recipe couldn’t be easier — a bit of chopping (the shallots, the sweet potato), a series of quick sautés starting first with the meat, followed by the potatoes (I increased the pan time here from 10 minutes to 15, as I wasn’t convinced the potatoes would be tender enough), then finally the shallots. Once done all three are mixed together in the pan and drizzled with the syrup and vinegar, an addition that enhances the caramelized quality of the shallot and potatoes while underscoring the salty/sweet combination of flavors. Perfection. And a welcome addition to my Sunday morning breakfast arsenal. 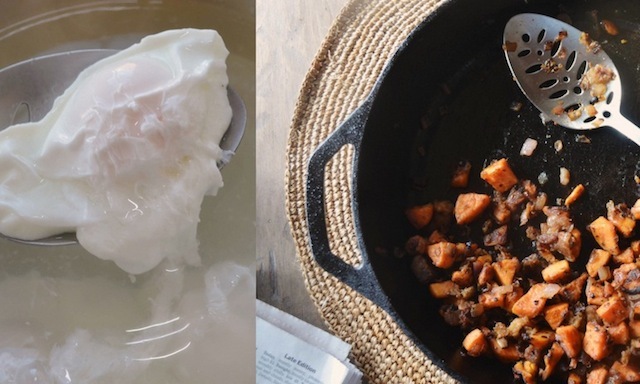 One final note: although the recipe lists as optional the addition of a single poached egg to each serving of hash, it’s a move I strongly encourage. The yolk here serves to sauce the finished dish, moistening the potatoes and pork and enhancing the entire experience in that miraculous way that only a really good sauce can. In fact, unless you’re feeding the toddlers pictured in BA’s photo, I’d increase the number of eggs from one to two per person. 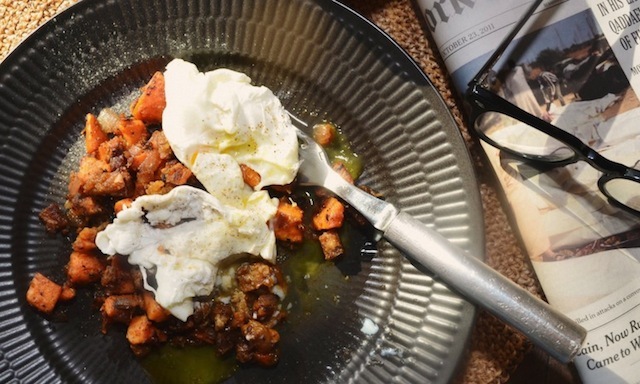 I mean seriously, this is pork hash we’re talking about — why hold back now? See directions at the end of this posting for my foolproof method for poaching an egg. *Banyuls vinegar (which has been showing up on an increasing number of new recipes lately) is made from the sweet wine of Banyuls-sur-Mer in southwest France, where it’s barrel-aged for five years or so. The vinegar develops a tart, nutty flavor that’s richer and more complex than the balsamic variety. 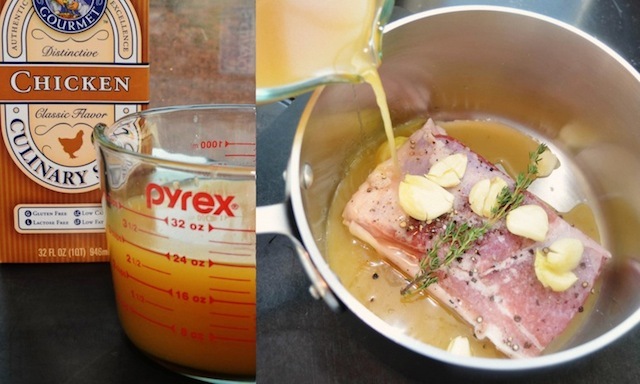 Note #1: If substituting the slab bacon for the pork belly you will not need the thyme, garlic, or chicken stock. Note #2: If using pork belly you will need to order this in advance, either from your butcher or through heritagepork.com. —Preheat oven to 275 degrees. Season pork belly generously with salt and pepper. Place in a large ovenproof saucepan. Add thyme and garlic. Add chicken stock. Bring to a simmer over low heat, cover tightly, and braise in oven until tender, about 3 hours. 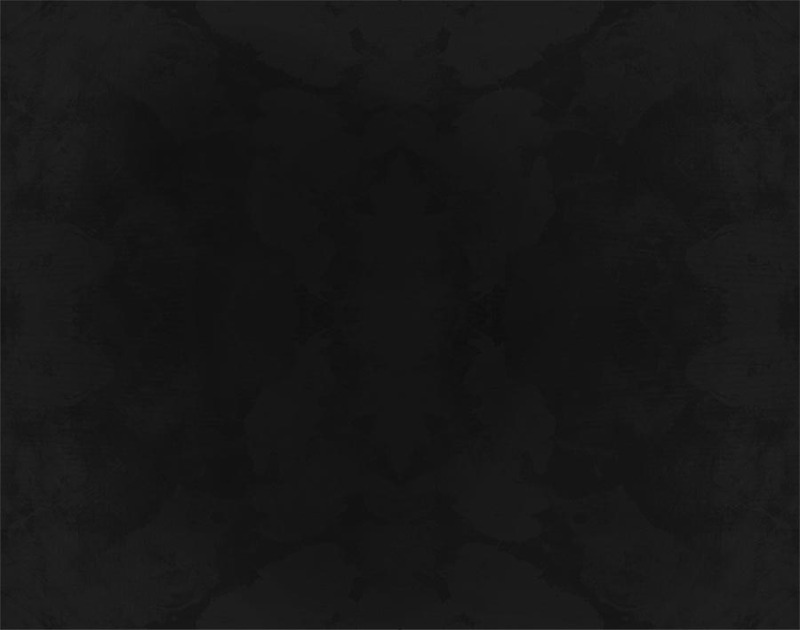 Uncover; let cool. Transfer pork belly to a 9” glass pie dish. Place another 9” glass pie dish on top of pork belly. Weight with a 15-oz canned good. Chill overnight. 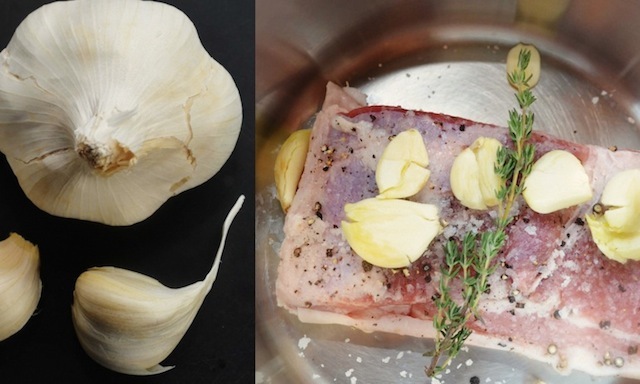 —Remove skin from pork belly. Cut meat in ½” cubes. Heat 1 tbsp oil in a large cast-iron skillet over medium-high heat. Add pork and sauté until browned on all sides, about 4 minutes. 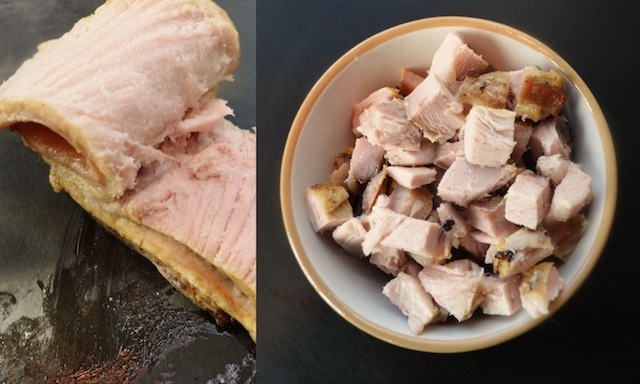 Using a slotted spoon, transfer pork to a medium bowl. Season potatoes with salt and pepper. Add to same skillet; sauté until golden brown, about 10 minutes. Using slotted spoon, transfer to bowl with pork. Add 2 tbsp oil and shallots to skillet; sauté over medium heat until golden brown, 3—4 minutes. Return potatoes and pork with any accumulated juices to pan. Drizzle with vinegar and syrup mixture; stir to coat. Cook, stirring occasionally, until heated through, about 2 minutes. Serve with poached eggs if desired. —Cut meat in ½” cubes. Heat 1 tbsp oil in a large cast-iron skillet over medium-high heat. Add bacon and sauté until browned on all sides, about 4 minutes. Using a slotted spoon, transfer bacon to a medium bowl, and pour out about half of the bacon fat. Season potatoes with salt and pepper. Add to same skillet; sauté until golden brown, about 10 minutes. Using slotted spoon, transfer to bowl with bacon. Add 2 tbsp oil and shallots to skillet; sauté over medium heat until golden brown, 3—4 minutes. Return potatoes and bacon with any accumulated juices to pan. Drizzle with vinegar and syrup; stir to coat. Cook, stirring occasionally, until heated through, about 2 minutes. Serve with poached eggs if desired. 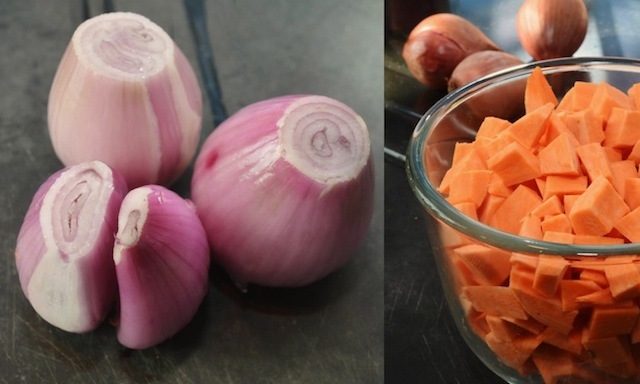 —Bring water to almost a boil in a shallow saucepan or skillet. Add two tablespoons distilled white vinegar or seasoned rice vinegar. —Working with one egg at a time, crack egg into a cup, place cup close to top of the water, then gently drop the egg into the water. 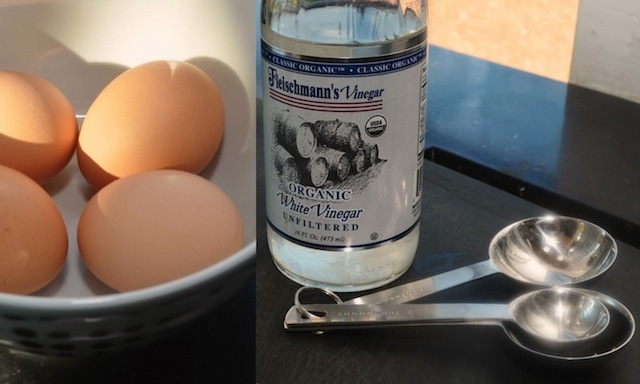 Using a spoon, nudge the egg whites closer to their yolks. 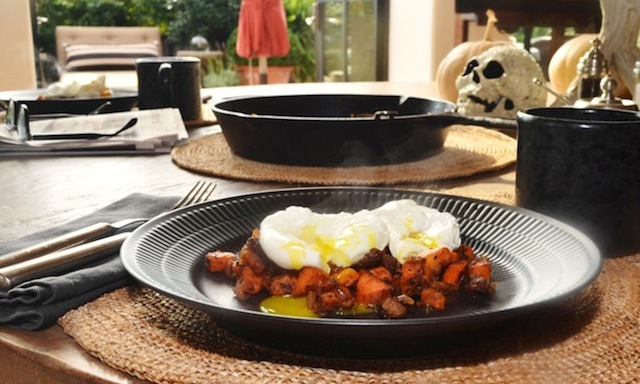 Note: as many as eight eggs can be dropped into one 12″ pan and cooked simultaneously. —Turn off the heat. Cover the pan. Let sit for 4 minutes, until the whites are cooked through. —Lift eggs out of pan with a slotted spoon. I can't wait — poached eggs TRG style. Looks great. Do you think it would be just as good to use bacon? Looks really good.Anne and I will try it. Hi Isabel! If using bacon here you'll need the slab variety i.e. a one pound hunk that hasn't been sliced — sliced bacon will crisp up too much and the pleasure of the pork in this dish is a crispy exterior and a tender interior. 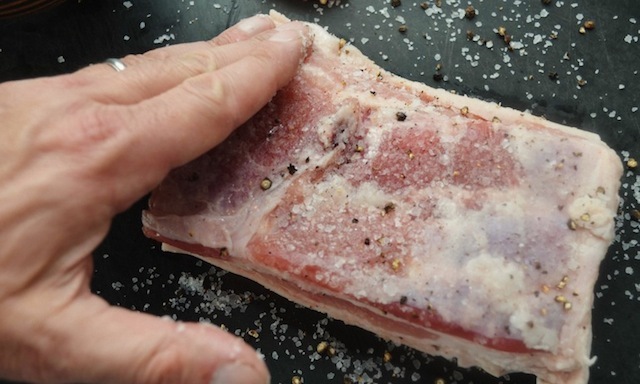 Ultimately the pork belly is the best option for this as it's meltingly tender, but if you're pressed for time or simply can't deal with the extra steps involved in the pork belly, slab bacon is a great way to go!